NSL Kickball from Philip Steen on Vimeo. Been wanting to try something new this year? Or maybe you're just looking for a new social experience that will also get you active? Lightning 100's kickball team, The Lightning Bolt Ballers, is the perfect combination of the two! 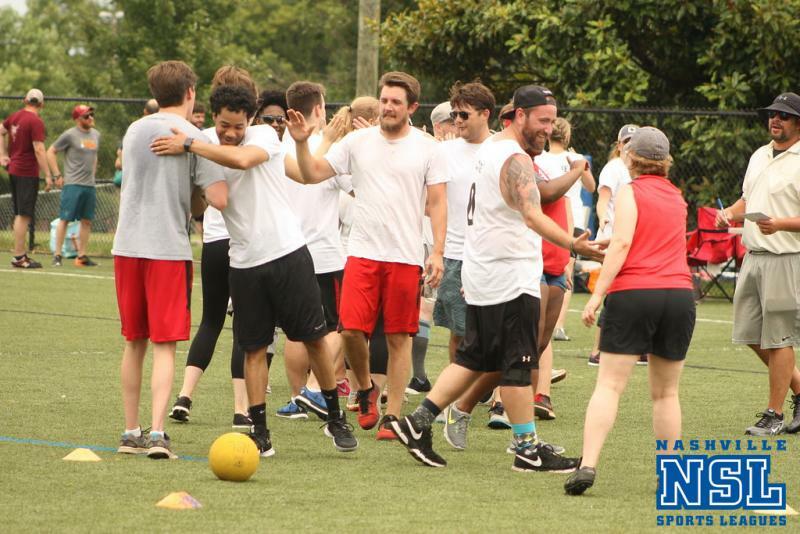 Nashville Sports League is Nashville's premier social athletic experience, and is casual enough even for those who have never played kickball before. Games will be every Monday evening at East Park starting March 11th (lasting 7 weeks). After each game, we'll head over to a team-bonding happy hour with NSL discounts for post-game food and drink specials as part of the NSL experience. Cost: $45 Price includes a custom team shirt! Difficulty: This is a beginner-friendly, social league. All ability levels are welcome and no experience is necessary! Registration Deadline: Friday, February 11th at 3pm. Please see registration instructions below. Parking: Free parking is available at East Park. NSL is a social sport organization hoping to bring together the growing community that is Nashville by inviting its members into friendly competition. Registration is required for this event! We will have other sporting opportunities as well, so if this event fills before you can sign up, please e-mail teamlightning@wrlt.com for first priority in future NSL team sports!